Would you like a fresh set of eyes on your competitive scholarship essay? If so, the Doyon Foundation Alumni Association members would love to help! A group of Foundation alumni have volunteered to review Doyon Foundation students’ competitive scholarship essays before the Monday, May 16 deadline. The essay is an important part of your application, worth up to 40 possible points (out of a total of 120 possible points), so all applicants are encouraged to take advantage of this opportunity. If you would like to have your essay proofread, please contact Maurine McGinty at mcgintym@doyon.com. To allow adequate time for review, please send your essay no later than Monday, May 9 at 5 p.m. Thank you to everyone who participated in our recent language revitalization interest survey – and congratulations to the following survey respondents who each won an Amazon gift card! All individuals who completed the language revitalization interest survey by the March 27 deadline were entered into a random drawing for a $50 or $100 gift card. The survey asked Doyon, Limited shareholders about their opinions on language revitalization, information about their knowledge and use of Native language, and their thoughts on proposed language revitalization strategies. We are currently analyzing the survey data and will share details on the survey results soon, so keep an eye on our website, blog and Facebook page! BLaST Undergraduate Scholarships are due June 18, 2016. A flyer is attached for distribution. For more information about BLaST visit http://alaska.edu/blast/. Lance (X̱’unei) A Twitchell, Assistant Professor of Alaska Native Languages Speaks at UAF! Lance (X̱’unei) A Twitchell, M.F.A., Assistant Professor of Alaska Native Languages, will be in Fairbanks to give a talk on language revitalization efforts from a Tlingit perspective. This will be held at the University of Alaska Fairbanks in the Brooks Building Gathering Room at 2:30pm on Thursday, April 28, 2016. Here is the title and description: Official Languages, Tribal Schools, and New Media: Facilitating Structural Changes That Foster Language Revitalization in Alaska. This talk explores the pieces in place and potential next steps for reversing language shift for Alaska Native languages. By studying Hawaiian, Māori, Sámi, and Gaelic language movements, one can see that Alaska is ready for structural changes that decolonize landscape, insert Tribal self-governance into education, and change the ways we value our indigenous languages. Alaska Permanent Capital Management is committed to giving Alaskan Students real world opportunities. They have started a rotating internship program to correspond with spring, fall and summer semesters. APCM is actively looking for applicants for this summer. Enclosed are details about the company and the internship, please note the short application period. If you have any questions, please do not hesitate to call Laura Bruce, CFP®, ChFC®, SVP, Director of Client Relations at 907.646.3509. This weekly Language Revitalization Digest mailing is an effort to connect Alaskans who are invested in Native language revitalization. A digest will be mailed every other week and include relevant news articles, stories from around Alaska (they are requesting your assistance with this), and anything else meaningful and inspiring. Anyone is welcome to contribute! Contact David.Russell-Jensen@akleg.gov to subscribe and contribute to this exciting language digest! 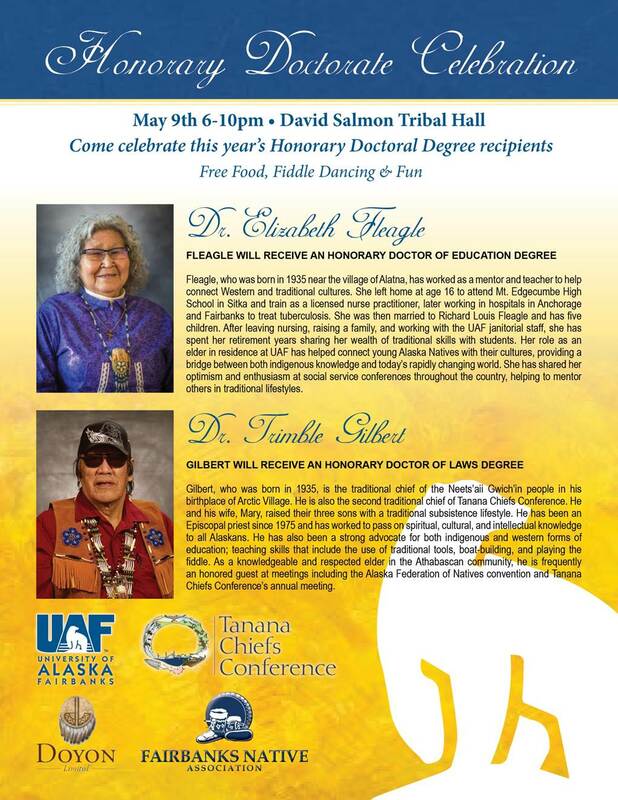 May 9 UAF Celebration EVERYONE WELCOME!